Rudolph P. Pardonek, 91 of Hammond, passed away peacefully on the morning of Monday, January 14, 2019 at the Hammond-Whiting Care Center. He was the beloved husband of the late Deloris J Pardonek (nee Thompson) who passed away December 23, 2005; loving father of Thomas (Becky) Pardonek, James (Laura) Pardonek, Leslie McAdams, Kimberly (Kenneth) Wall and Laura (Spero) Alexiou; cherished grandfather of Andy, David and Kati Pardonek, Larry (Kristen) Keilman, Adam (Maggie) Keilman, Sara (Kevin) Potchen, Sydney Pardonek, Ashley (Steven) Foster, Samantha, Angela and Michael Alexiou; adoring great grandpa to many; dearest brother of William (late Helen) Pardonek, Dorothy (Richard) Falconer, Florence (Salvatore) Celona, Marie (late Victor) Clement and Mildred (Michael) Spagno; dear uncle to many nieces and nephews. Funeral services will be held on Friday, January 18, 2019, 9:30am at the Baran Funeral Home, 1235-119th St., Whiting; a Mass of Christian Burial will be offered at 10:00am at St. John the Baptist Catholic Church, Whiting, with the Rev. Jay Nuthulapati, C.PP.S., officiating; interment, Elmwood Cemetery, Hammond; visitation at the funeral home on Thursday from 4:00 to 8:00pm; parish wake service at the funeral home on Thursday at 4:30pm. Rudy Pardonek was born on May 13, 1927 in New York City to Joseph and Susan (Bencur) Pardonek and was a resident of Hammond for over 70 years. 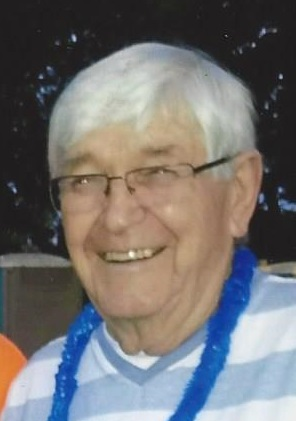 He was a member of St. John the Baptist Catholic Church, Whiting and the Knights of Columbus, Lansing Council 3540. He was a WWII Army-Air Force Veteran and was a member of the American Legion, Whiting Post 80 (Memorial Service, Thursday at 6:30pm). Rudy was a member of the Hammond Police Dept., retiring as a Detective-Sergeant with a service of 21 years and was a member of the Hammond FOP Lodge 57 (Memorial Service, Thursday at 6:00pm). He was also a retired head of security for NIPSCO with a service of 15 years. Rudy loved woodworking and model cars, was a “groupie” of the band “The Relics” and enjoyed making stained glass pieces. Devoted to his family, Rudy will be sadly missed by all who knew and loved him. In lieu of flowers, memorials to the American Cancer Society would be appreciated.